According to many, Manihiki is the most beautiful of the Cook Islands. 40 tiny islets encircle a lagoon four kilometres (2.5 miles) wide. And this completely enclosed body of water is the source of the island's greatest asset...black pearls. 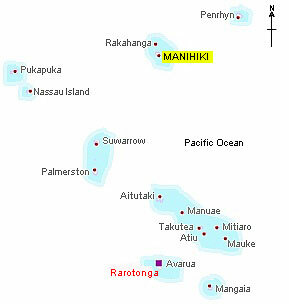 Polynesians are believed to have lived on Manihiki since at least 1500 AD. It was discovered by Europeans on 13 October, 1822 when the US ship "Good Hope" sighted it. Its commander, Captain Patrickson, named it Humphrey Island. While the island is justly famous for its black pearls, one of its unihabited islets or motu has a pearl of its own. An enclosed lake on Porea is used to farm milkfish (ava), a notoriously boney but - I'm told(!) - extremely tasty species. You can visit Porea and other islets on a lagoon cruise which also includes a chance to snorkel among clams, oysters and a wealth of other marine life in the crystal clear lagoon. It costs NZ$55. And this is where you can stay....a villa on the very edge of the lagoon. Manihiki Lagoon Villas are in the village of Tauhunu which is about 20 minutes from the airport and the village of Tukao. Visitors are are transferred to Tauhunu by boat. All meals, airport transfers, kayaks and snorkelling gear are provided, but you're advised to take your own favourite snacks as shopping facilities are almost non-existent. Nancy and Kora who run the Villas can also arrange fishing, diving, snorkelling and pearl farm visits for you. Make sure also that you take plenty of cash...plastic money isn't accepted and there are no ATMs! Like its sister island of Rakahanga 44 kms (18 miles) north, Manihiki sits on top of an underwater mountain which rises 4,000 metres (13,000 feet) from the ocean floor. But the island itself is flat and only 4 metres (13 feet) above sea level at the highest point. A survey for the Ministry of Marine Resources in Rarotonga in the year 2000 calculated 1.5 million oysters were being cultivated. This survey also recorded 111 farms with a total of 690 culture lines and 424 spat collection lines (such as the one pictured left). The total length of these farm lines was 160 kilometers, with the farms themselves covering seven square kilometres. A quarter of a million black pearls were being produced each year. The industry has been at a low ebb for sometime now, in the face of stiff competition from China and Japan. In 2011, it earned the Islands just NZ$85,000. But the Cook Islands Pearl Authority was recently relaunched with the aim of tightening up on standards and boosting promotion worldwide. Pearl farming, centred at Manihiki atoll, involves cultivating the special black-lipped mollusk otherwise known as the "Pinctada Margaritifera", or black-lip mother-of-pearl. A black pigment is naturally secreted by the mollusk and provides the resulting pearl with a basic colour ranging from black to gray. It takes 18 months to 2 years for the pearl to reach the required size, and the outstandingly clear water of the Manihiki lagoon is vital to the growth and quality. You can experience first hand how the pearls are made. For NZ$40 (NZ$20 for children), you can take an informative tour of a pearl farm, learn all about the seeding and swim or snorkel over and around the pearl lines. One report* described the terrifying day: "Housing was flattened, public facilities destroyed, crushed coral roads washed-out, and virtually all of the off-shore accommodation and equipment relating to the lagoon pearl-fishing industry was destroyed. Small boats, timbers and household contents were strewn everywhere, and sheets of cast-iron roofing were wrapped like tape around high trees. Sunken debris littered the edge of the lagoon to a distance of about 30 metres." And at one stage, there were serious discussions about abandoning the island altogether. On the afternoon of 1 November, 1997 - the first day of the hurricane season - cyclone Martin smashed huge waves through the villages and lagoon of Manihiki. 19 people died and 400 were evacuated to Rartotonga by the Royal New Zealand Air Force. 10 others were missing and in 2004 they too were officially declared dead. Some evidence of that day still remains - pieces of boats, tyres, trees and even fridges lie on the bottom of the lagoon. * Extract from "Observtions from a Cyclone stress/trauma assignment in the Cook Islands"
Air Rarortonga operate flights every Tuesday from the capital island. It takes about three and a half hours to reach the island, and you need to dig deep to pay the fare. A standard return from Rarotonga costs nearly NZ$1,600, There are also inter island flights from Manihiki to Penrhyn and also to Pukapuka. Check the airline's website for details if you are thinking of visiting more than one island. And be aware that flights to these remote northern group islands can sometimes be cancelled at short notice - either because there aren't enough passengers to make the trip viable, or if there isn't enough fuel at the destination airport.